Every day, Watch This offers staff recommendations inspired by a recent movie. This week: In honor of The Heat, we assemble a lineup of buddy-cop movies. The term “sleeper” has practically lost all meaning in this age of fragmented, target-specific audiences, but there was once a time when a completely unheralded low-budget movie could sneak right up on you. Folks who more or less randomly wandered into The Hidden back in 1987, for example, were treated to an opening act so insane that it seemed impossible to top. They then settled in to discover that the entire film is significantly smarter—and far more crazily inventive—than its modest pedigree would suggest. Part of the fun is that it’s unclear for a remarkably long time exactly what the story is. Initial scenes of severe vehicular mayhem suggest that the bad guy is a wantonly homicidal maniac (played by ’80s utility creep Chris Mulkey), and we’re introduced to an FBI agent (Kyle MacLachlan) who’s been tracking the guy for weeks and an LAPD detective (Michael Nouri) assigned to help. Almost immediately, however, Mulkey is mortally wounded, and the real “bad guy”—a tentacled, slug-like creature as long and thick as an arm—crawls out of his mouth and into the mouth of the patient in the next hospital bed. That isn’t the last of its hosts, and as Nouri and MacLachlan doggedly pursue it from body to body, the former gradually begins to realize that there’s something a bit off about the latter as well. Directed by Jack Sholder (who also made the fascinating second Nightmare On Elm Street installment, Freddy’s Revenge) and written by Jim Kouf (using the pseudonym Bob Hunt, for some reason), The Hidden has no use for propriety or wasted energy. In that opening car chase, Mulkey casually runs over an old man in a wheelchair, and that pretty much epitomizes the film’s general approach, for better and worse. (Mostly for the better.) 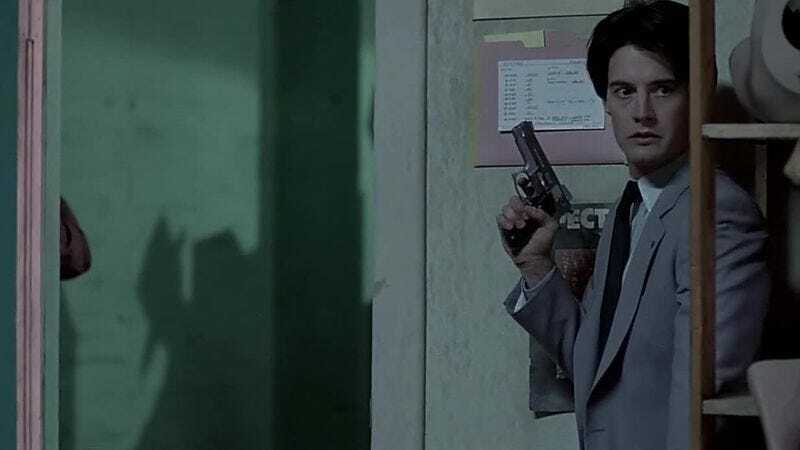 MacLachlan had just seen his career resuscitated by David Lynch with Blue Velvet (two years after Lynch nearly killed it with Dune), and he performs something of a dry run for Twin Peaks’ Special Agent Dale Cooper here, only even more weirdly stilted. He and Nouri make a great team, in large part because only one of them knows the true nature of their working relationship. Most buddy-cop movies involve a large degree of emotional symbiosis; without spoiling the ending, this one takes that to the ultimate extreme.